Since its inception in 2009 Evo E-liquid Evolved has increased their Signature line of already popular American-made flavours manufactured by Nicopure Labs and have not wasted any time in adding a further Twenty Two delectable premium flavours in two separate categories. The Harvest Collection carries eleven and the Café Collection brings a further eleven both in a broad variety of differing tastes. Growing in popularity amongst the vaping community and making a name for itself as one of the finest producers of American Premium E-liquids EVO, renowned for its quality and increasing the variety of flavours, and of course, attention to detail when manufacturing their juices by only using only the finest ingredients available on the market. These latest two lines of Premium E-liquids have been delicately crafted to give the consumer the best possible flavour in as greater choice as possible, always with consumer safety in mind. Ingredients in the makeup of these juices include Propylene Glycol (USP) Glycerin (USP) FEMA/GRAS Approved Natural & Artificial Flavourings L-Nicotine. Each ingredient in every batch of their e-Liquid is tested to USP (United States Pharmacopeia Convention) standards to ensure the purity and safety of the products. In addition to this, the nicotine concentration of every final batch is verified by HPLC and NMR to ensure the safety of the customer and helping to maintain the very highest quality in the production of these fine elixirs. All approved batches are issued a final Certificate of Analysis for CGMP release from the lab and assigned a unique Batch Code for tracking further down the supply chain. Nicopure Labs uses the latest technologies in mixing, filling and labelling to help ensure a streamlined production with the highest quality finished product for the consumer. The Nicopure Labs formulate all e-Liquid using only current good manufacturing practices in an FDA registered facility. These methods provide for a system that assures proper design, monitoring, and control of manufacturing processes and facilities. Developing these e-Liquids in the right way not only offers their customers quality assurance but will soon be a requirement as the FDA actively regulates the industry. I have reviewed these juices over a period of two weeks on three different manufacturers VV/VW devices. These include the Innokin iTaste SVD 2.0 along with the eVic Supreme 30w, plus the inclusion of the Innokin VV4 with the attached Kangertech Nano fitted with a 1.2ohm Organic cotton coil. I have also used a combination of three different tanks including very latest Kangertech SubTank Mini & Nano as I have mentioned (Reviewing Soon) and the Kayfun in varying combinations using the ranges suggested in this chart for added consistency. 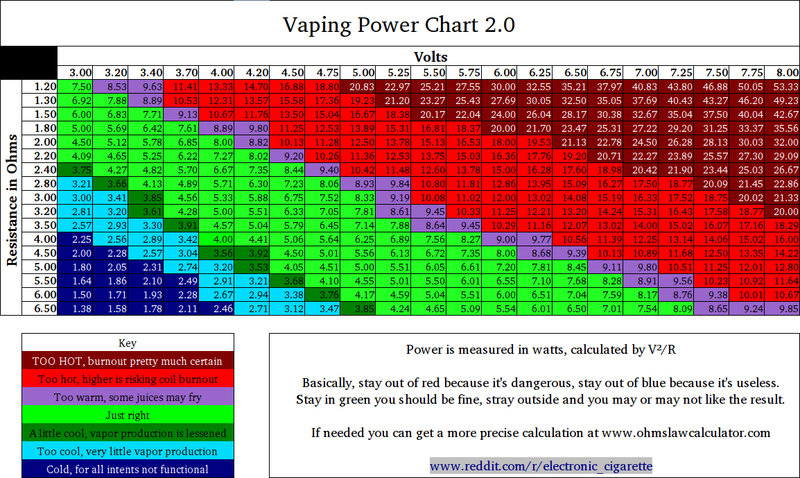 I have also vaped these E-liquids at 25w using the eVic Supreme. Every EVO e-liquid bottle is safety sealed with a child resistant cap incorporating a standard push and turn design. All EVO bottles are labelled with standard safety warnings, nicotine concentration, “best by” date, and a unique Lot Code indicating the batch from which the liquid was derived from. The new EVO line of flavoured E-liquids comes in both a10ml & 30ml bottle size. The 10ml size comes in a standard plastic bottle with a child proof plastic cap, while the 30ml size has a glass bottle including a glass pipette dispenser also with a child proof plastic cap. Prices start at around $7.99 for the 10ml bottle and $17.99 for the 30ml sized bottle. A good interpretation of a banana flavoured juice, without the acidic taste, left behind. Both smooth and creamy with a definite note of fresh banana, this juice also includes a very subtle pastry bottom note too. Think of a banana split and you get the flavour representation straight away. A chocolate or strawberry note could very easily be added to this and would only serve to compliment it further. Two perfectly matched flavours complimenting each other and my personal favourite in the cafe line. Simple but effective when vaped at a warm temperature adding to the richness I experienced while vaping it, this is a sure favourite for those like me with a sweeter tooth. On the inhale you are met with a creamy caramel sensation followed by the coconut cookie note on the exhale. So If you happen to be working for Nicopure in the shipping department and happen to find a spare 120ml of this flavour lying around I can suggest an address where it will not go to waste or reach its sell by date! Well presented. Or also known as muskmelon, is commonly found in the United States, Mexico and in some parts of Canada with a firm, orange, moderately sweet flesh and a thin reticulated, light-brown rind. This juice produces a somewhat sweet tasting and mouth watering experience that will be suited for those very hot dry days. How close it is to the actual fruit itself I cannot say but it is a pleasant experience nonetheless. Livening up an already familiar flavour, Iced Banana Mint has been given an extra boost with the addition of a fresh mint leaf undertone added to it. This combination works well together creating a smooth, fresh sensation in the palette. On the inhale you become aware of the mild banana taste lingering on the tongue followed by a subtle but present undertone of fresh mint on the exhale. Again this flavoured banana blend produces no acidic aftertaste that in itself is a sign of the quality of the ingredients used in making up this particular flavour. For those of you lucky enough to be experiencing warmer climates than me, Tropical Twister should be a consideration when selecting your next juice. The complexity and attention to detail shown when creating this flavour is testament to the dedication shown by the mixologist who created it. Combining blueberry and lemon, being the two most prominent notes I detected, and rounding it off with a delicate undertone of coconut, it produces a refreshing and revitalising vape that can be experienced by the consumer all day. This is a magnificent example of what a tropical blended juice should be in my opinion. Limelight is a sweet and tart Key Lime blend with exceptional citrus flavour. As described by Evo and I cannot add any more to their description of this other than to say that it is a refreshing citrus experience neither too sharp or too sweet, making for a satisfying vape but not all day for me personally. A popular flavour that has been around for some time, however, this one has had a makeover with the inclusion of a twist of lime giving that creamy smooth fruit experience just that little extra bite! It’s nice to see some creativity being shown in the production of new flavours as many have been done to death including this one, so a shout out to the team at Evo for going that extra mile on behalf of their customers and producing some original and much-needed updates that work! A new and unusual flavour for me personally, but none the less an enjoyable one. This is a slightly sweet apricot flavour that also includes that subtle tang found when eating the fruit itself. Adding a pastry or crumble bottom note to this would make it an, even more, pleasant experience, rounded off with a dash of fresh or Cornish cream- Perfection! EVO’s two new lines will undoubtedly become renowned throughout the course of 2015 introducing some much needed original flavours allowing the consumer a greater choice of what I am sure will become a very pleasant and refreshing vaping experience. Presentation and labelling of both the plastic and glass bottles are clear and detailed giving the consumer all the information that they require about a particular juices makeup along with its nicotine levels including an expiry date that is an important consideration when taking into account a product’s shelf life. Also, the use of a glass bottle and matching glass pipette dispenser helps to safeguard against the possibility of Leeching with the 30ml size. The nicotine range is also extensive, offering a much-needed 24mg as I had mentioned before in a previous review helping heavy smokers and those who prefer hand-rolled tobacco make the transition over to what I believe is a safer alternative to the traditional cigarette. Vaper production for all flavours supplied to me for this review was plentiful at all the ranges I have used in this review producing an airier vapour rather than a heavy one. Throat hit was present using all flavours in this review and smooth using my preferred personal intake of 12mg. A special mention goes to the banana flavoured juices as it was nice not to have that acidic taste left behind on the exhale but an aftertaste of the fruits themselves. Their online website is both detailed and easy to navigate being both informative and very well laid out giving the consumer all the relevant information about a particular juices makeup. My personal dealings with the company have been extremely helpful and friendly at all times while maintaining a professional approach. The price range makes these juices excellent value for the money, especially when you consider the level of detail that goes into making them. For further information on the full range of flavours offered by EVO in the Harvest & Café collections, please use the link below to view them on their Facebook page. All rights reserved. No part of this publication may be reproduced, distributed, or transmitted in any form or by any means, including photocopying, recording, or other electronic or mechanical methods, without the prior written permission of the publisher, except in the case of brief quotations embodied in critical reviews and certain other non-commercial uses permitted by copyright law. For permission requests, please write to the publisher, addressed “Attention: Permissions Coordinator,” at the address below. subject, made me individually believe it from so many numerous angles.